Microplastics: why the big deal? However, microplastics are hardly a new issue - in 2007, they were highlighted in a scientific review as an ‘emerging contaminant of potential concern’. Since then, they have turned into what looks like a pretty big problem: a 2014 estimate put the number of microplastic particles in the oceans at somewhere between 15 and 51 trillion particles, weighing anything up to 236 thousand metric tons. This may sound like a huge amount of plastic - and yet, based on the findings of the Manchester team's study, this could actually be a vast underestimate of the amount of microplastic in our oceans. Microplastics are nothing more than tiny pieces of plastic, less than 5 millimetres in diameter. The smallest microplastic particles detected, however, are considerably smaller than this - thousands could fit on a single pinhead. In fact, it is likely that plastic microparticles exist which are simply too small to detect using standard research methods. Most of us are familiar with the plastic items we use day-to-day as being relatively large - certainly larger than a microplastic particle. So where microplastic comes from may seem a bit of a mystery. ‘Primary’ implies that microplastic particles were ‘deliberately’ produced as part of a manufacturing process. A large source of such microplastic particles are cleaning products - tiny plastic beads are used as abrasives in industrial processes, but also in cosmetics, including face washes, hand soaps and toothpastes. They are also widely used to manufacture medicines - microbeads have versatile properties which can be exploited, for instance, to help optimise drug delivery to particular sites in the body. Another important primary source of microplastics are textiles - tiny plastic fibres can rub off fabrics when they are washed. Finally, plastic beads or pellets are often used as precursors for making larger plastic items - these can ‘escape’ during transport, or even during the manufacturing process itself. ‘Secondary’ micro plastics arise when large plastic materials are progressively broken down into smaller fragments through environmental processes, usually in the context of marine environments. There are two stages to this process: First, the plastics are degraded. This has the effect of reducing their average molecular weight, which, in practical terms, means that the plastic becomes more friable. The second stage to the process is fragmentation: the weakened, fragile plastic will fall apart into tiny particles. Usually, degradation occurs during exposure of plastic to sunlight: When plastics are exposed to UV-B rays they undergo ‘photo-oxidative degeneration’ - breakdown through the action of light. This action can be sped up by absorption of infrared rays: this heats the plastic, accelerating photo-oxidative degradation, and also initiating the slower process of thermo-oxidative degradation (breakdown by heat at moderate temperatures). These processes result in the surface of the plastic developing microscopic cracks - these flake off with changes in temperature or humidity, or by rubbing against sand, producing microplastic fragments. Degradation and fragmentation occur very efficiently on beaches, where sand reaches high temperatures and the plastic is exposed to plenty of light. Plastics already in bodies of water, such as the sea, are at lower temperatures and are generally exposed to less UV light. Additionally, they tend to get coated in biofilms, algae and other marine invertebrates - a process called ‘biofouling’, which makes the plastic more resistant to degradation. As such, the vast majority of secondary microplastics originate on beaches, and are subsequently washed in to the sea. No matter where microplastics originate, the final common end-point in their journey is the oceans. Microplastics from domestic and industrial use are collected in sewage and wastewater, and can be washed out of riverbeds and off beaches during rainstorms. Often, they end up in the sea directly, either due to accidents during transport, or through human littering of coastlines. As we already saw, because degradation occurs much less efficiently once plastics are in the water, direct littering of the ocean is a much less important source of microplastic compared to beaches. At present, it is not entirely clear what effect microplastics have on marine wildlife. Importantly, they are similar in size to phytoplankton, which forms the staple diet of zooplanktons. It has been observed in laboratory studies that zooplanktons do not differentiate between phytoplankton and microplastic particles when feeding, ingesting both indiscriminately. Zooplanktons themselves are consumed by larger marine organisms, including fish. In this way, microplastics can have an effect on every level of the marine food chain. Although there is a possibility that microplastics are directly toxic to marine organisms, this seems unlikely - most organisms don’t have the means to break down microplastics in their digestive tracts, and as such, the particles are thought to be relatively inert when ingested. However, microplastics usually contain precursors left over from the manufacturing process, and also accumulate by-products of degradation as they are exposed to heat and sunlight. Such compounds are thought to be toxic, and there is evidence that they ‘leak out’ of plastic Microparticles over time. This in itself contributes to the overall level of pollutants in the ocean. It is also possible that such chemicals could reach harmful levels within marine organisms through the progressive build-up of microplastics in the food chain: there is strong evidence that microplastics can be transferred between trophic levels, meaning that microplastic probably accumulates in the food web over time. It is still unclear what overall effect this might have on marine fauna. A much bigger area of concern is the way in which microplastic particles interact with pollutants in the water. The biggest culprits involved in this interaction are chemicals known as ‘Persistent Organic Pollutants’ or POPs. These derive from pesticides, solvents and pharmaceuticals, and other industrial solvents. POPs become accumulated on the surface of microplastic particles, and achieve concentrations many times higher than in the surrounding water. 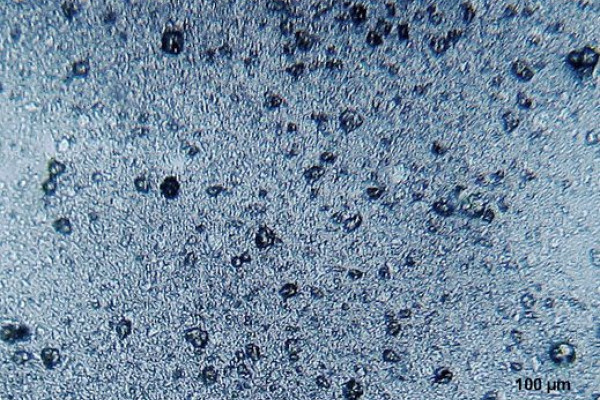 Due to this effect, POP-coated microplastic particles are likely to have toxic effects on marine microorganisms, such as planktons, when they are ingested. There is also evidence that gut enzymes cause POPs to be released from the microparticles during digestion. POPs then gradually accumulate in tissues and organs of larger marine species. They particularly seem to collect in fat tissues. The extent of damage this could cause is still unclear, but all consensus is that it is likely to have a considerable impact on marine ecosystems. An issue with microplastics is that they do not biodegrade - or at the very least, biodegrade at extremely slow rates. This means that once present, they cannot be removed from the environment through natural processes. Additionally, they are often too small to be efficiently removed through mechanical means from the bodies of water that they occupy. This means that the best way to limit the damage done by microplastics is to ensure that they do not enter marine ecosystems in the first place. Many research groups advocate policy-level interventions to diminish microplastic use: This has already gained some attention, with bans on the use of microplastic beads in cosmetic products gradually coming into force in countries around the world - first in the US in 2015, and most recently, in the UK, in January 2018. Other suggested courses of action include monitoring the use of microplastics in industry, with the aim of encouraging research into production methods and product design in order to limit the requirement for microplastics. Such measures should effectively address primary microplastics. In terms of secondary microplastics, limiting their entry into seawater should be much simpler, as it relies mainly on eliminating the larger pieces of plastic from which they originate: For instance, since plastic litter on beaches appears to be one of the most important source of secondary microplastic, the removal of large pieces of plastic from shores and coastlines should have a significant impact. As recognition of microplastics as a major ecological concern grows, scientists, governments, and industries are slowly beginning to catch up with attempts to limit the harm done. However, as the study from the University of Manchester shows, we still have a long way to go in our understanding of the true scale of microplastic pollution, and the magnitude of the effect this is having on natural ecosystems. Hurley, Rachel, Jamie Woodward, and James J. Rothwell. "Microplastic contamination of river beds significantly reduced by catchment-wide flooding." Nature Geoscience (2018): 1. Andrady, Anthony L. "Microplastics in the marine environment." Marine pollution bulletin 62.8 (2011): 1596-1605. Browne, Mark A. "Sources and pathways of microplastics to habitats." Marine anthropogenic litter. Springer, Cham, 2015. 229-244. Vacuum cleaners to clear ocean plastic?